Temperatures are still fairly mild in Cornwall at the moment, so why not take advantage of a nice break before the Christmas rush kicks in? Sea Owl Wonderfully modern barn conversion 2 miles from the beach. Offering accommodation for up to 6 people with full central heating. Anjarden Farmhouse 1700's granite farmhouse, this luxury house feels more like a stately home than a holiday cottage. With all the mod-cons and a wood burning stove sleeping up to 6 people. Wiggy's Cottage A gorgeous traditional cottage right in the centre of St Mawes, a few minutes walk from the harbour, shops and numerous restaurants. Sleeps up to 5 people in cosy comfort. The Threshing Barn Original stone building carefully restored last winter, set amongst rolling country farmland. 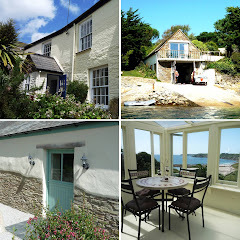 Ideal location for exploring Mid to West Cornwall and the North and South Coasts. Shared games room with storage for bikes or watersports equipment. Shellseekers Stunning luxury apartment in the centre of St Mawes with sea views and modern decor, Including a TV in the bath! Sleeps up to four in a double and twin room. Morwenna Lovely single storey apartment in central Cornwall. Open planned living area with a private patio and garden.